If you've had aspirations to be a weather person, standing there in front of a weather-speckled map of the world, or if you just want to add something interesting to your desktop, you might want to take a look at EarthBrowser. A simple shareware application, EarthBrowser is an animated planet Earth that spins on your desktop or can be run as a screen saver. 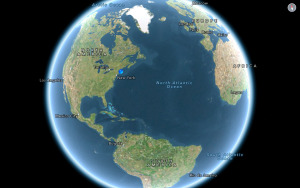 But the fun doesn't stop there, and while the virtual Earth spins, EarthBrowser provides a lot of useful information. The animation includes images of current weather conditions, similar to those used in TV weather -- as well as recent earthquake information. (It's cloudy where I am, and my area was also cloudy on EarthBrowser.) You can pass your mouse over the location of an earthquake to find out where it was, and how big it was. The program also includes links to various Web cams throughout the world, and doesn't require you launch a Web browser to view the images (though it does require an active Internet connection). I got a great shot of Abu Dhabi, as well as a great view of the Red Square in Russia. One problem I encountered with EarthBrowser was that even on a G4/400, the rotation of the Earth was jerky, and any changes I made to the view (enlarging it, or adding additional weather information) slowed down the spin momentarily until the machine could catch up. Overall, EarthBrowser provides you with more information than you'll probably ever need, and when you're not using your machine, your screen will be graced by an amazing image of our planet Earth, spinning in space.